This site is a work in progress - contact us with any information you have. Photographs have come from family members. Let us know if you have any photos to share! Our family history research is based on love of family that has been handed down through the generations. We started with a few family stories that gave hints and clues to dates and places. Visits to cemeteries gave us names, dates, and sometimes relationships to work into the family tree. Those trips also gave us an appreciation of the richness of the farmland. 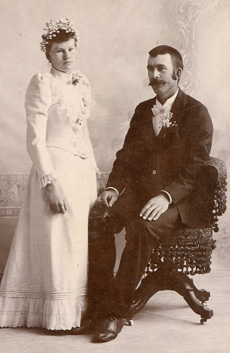 To the left is Anna Mary Riemann and Fred Chris Wunnenberg's wedding photo, March 30th 1891 in Des Moines County, Iowa.